Liv is the female-specific brand created by Taiwanese manufacturer Giant and, as the first women-specific bike with aerodynamics at the forefront of its design, the Envie is anything but a ‘shrink and pink’ job. Boasting a race-ready spec, the Liv Envie Advanced Pro 1 looks every inch a race-winning bike with its sleek AeroSystem shaped tubing, deep-section wheels and custom V-brakes all designed to reduce drag. Having riders like Marianne Vos and Pauline Ferrand-Prévot at its disposal to test the Envie, there’s no doubt that this frameset is fast. Giant was relatively late to the market with its men’s aero frame, but has made up for this in 2013 by being the first to create a women-specific aero bike. With all the technology at its fingertips, it was only a matter of time before it turned its attention to women. Despite looking markedly similar to the men’s Giant Propel, the Liv Envie boasts female-specific geometry with a slightly shorter top tube and taller head tube. Liv has used the same AeroSystem shaping technology with advanced grade carbon composite as it does for the Giant Propel range. Although it’s not Giant’s top of the range Advance SL carbon composite, reserved for the Propel SL frames, it still offers a great combination of low weight and high lateral stiffness. 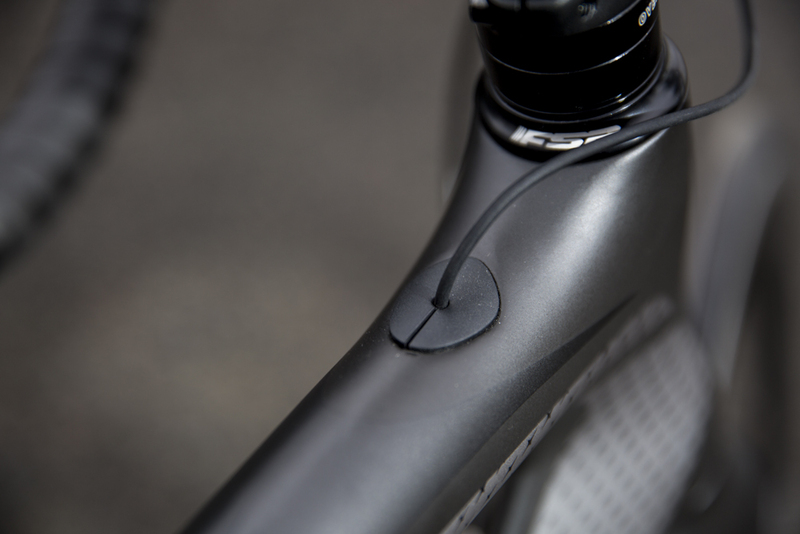 The slippery shaped tubing is enhanced with neat aero-inspired details like brake caliper mounts that sit behind the fork blades and the aerofoil-shaped seat tube with built-in seatpost clamp. 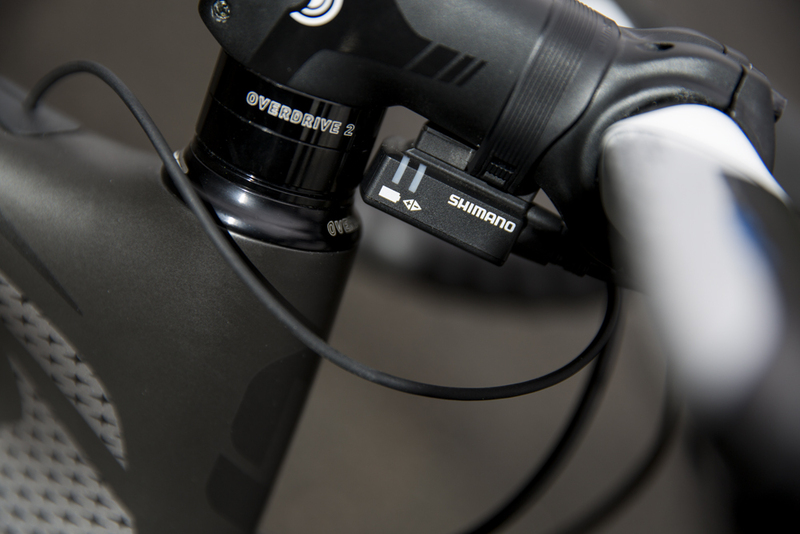 Built up with Ultegra Di2, this is a step down from the Dura-Ace-equipped steeds Vos and her team-mates ride. That said, the gap between the top-tier groupsets is shrinking and the seamless shifting is plenty good enough for national-level racing. The choice of a compact 50/34t chainset size gave a good range of gears with the 50×11 combination plenty high enough for keeping up when the big boys started drilling it on club runs, and the 34×28 was low enough to get us up the steeper climbs. Stronger women may need to upgrade this, though, and a mid-compact may have been a better option. 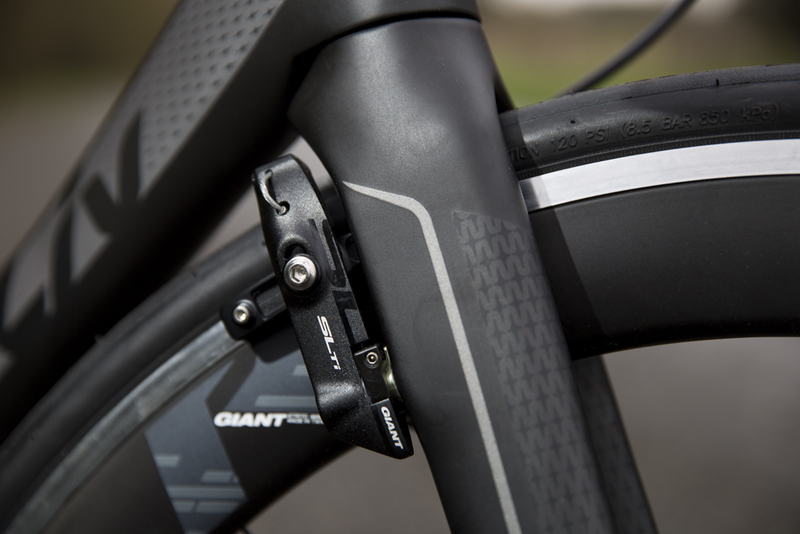 Much of the finishing kit is Giant’s own brand; from the bars and stem right down to the brakes, wheels and even the tyres. 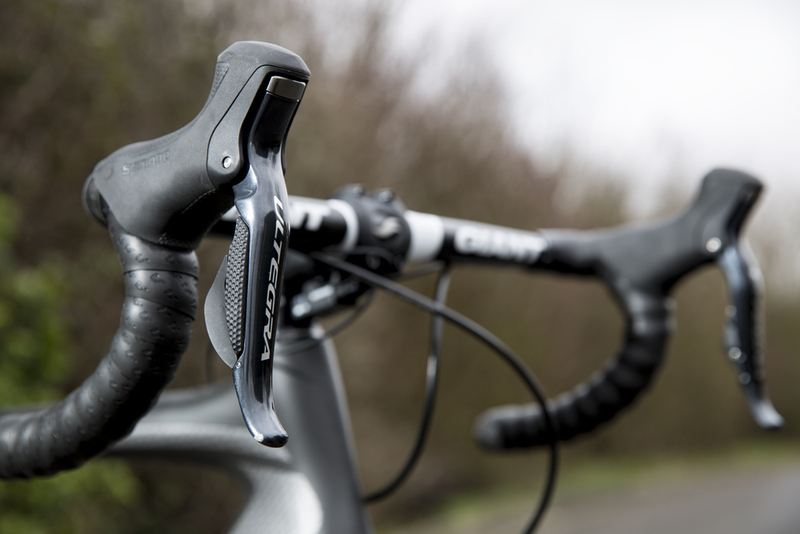 All of these parts exceeded my expectations, with the Giant Contact SLR aero bars standing out as particularly impressive. The narrow and compact design meant that getting tucked into an aero position felt natural and easy. My only grievance was the 80mm stem, as this made the bike a little nervous and twitchy — I swapped it for a 110mm version. 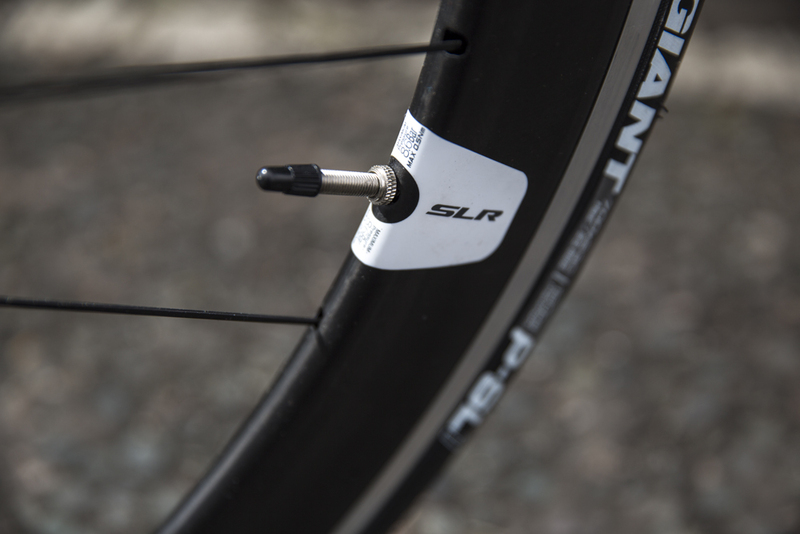 Giant’s own Speed Control SL V-brakes are tucked away out of the wind to further enhance the aerodynamics and gave great stopping power and modulation. 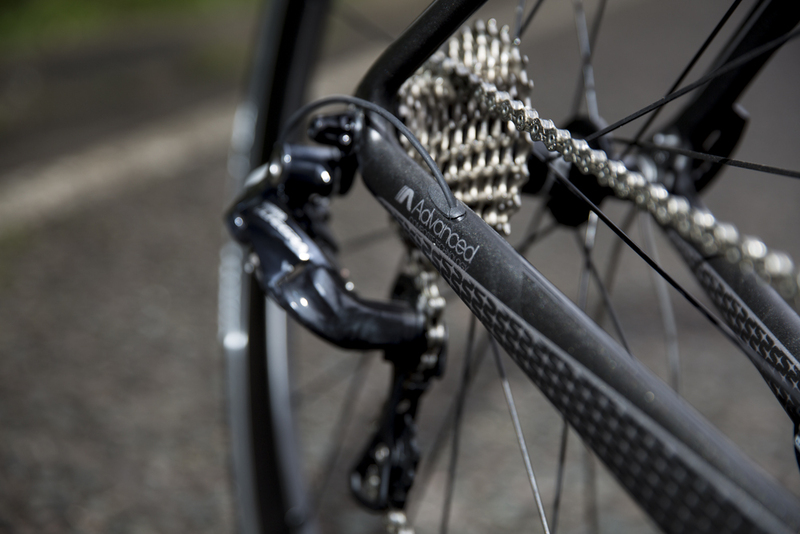 The rear brake felt a little spongy on occasion — perhaps due to cabling — but this didn’t affect overall stopping power. In keeping with the overall aero styling, the 50mm deep-section Giant P-SLR 1 wheelset gave a stiff and responsive ride with no movement even when riding out of the saddle. Despite an aluminium braking surface, the wheels are as light as many carbon models — perfect for those wanting to race, but with the benefits of more predictable and reliable braking. 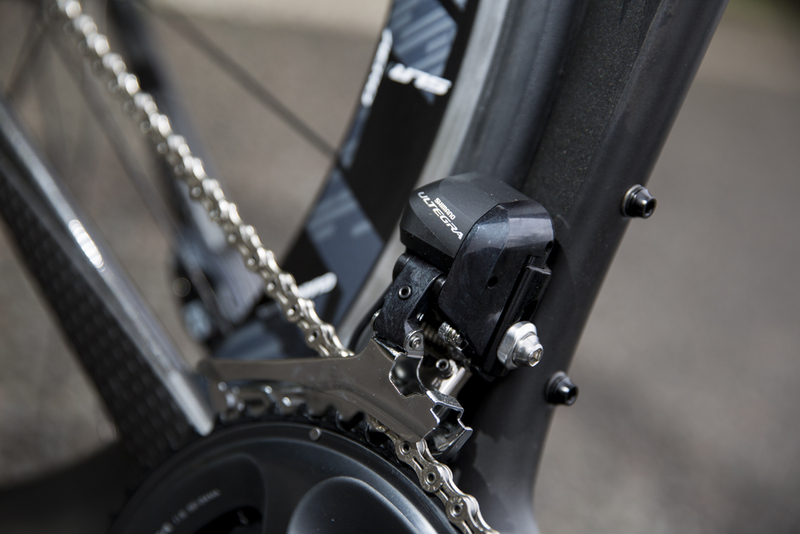 However, deep-section wheels aren’t for all conditions or riders and having these as standard means you may want to invest in something a little shallower for training. The Envie is topped off with a female-specific Fizik Arione Donna saddle. After switching to a longer stem, the handling of the Envie was spot-on. 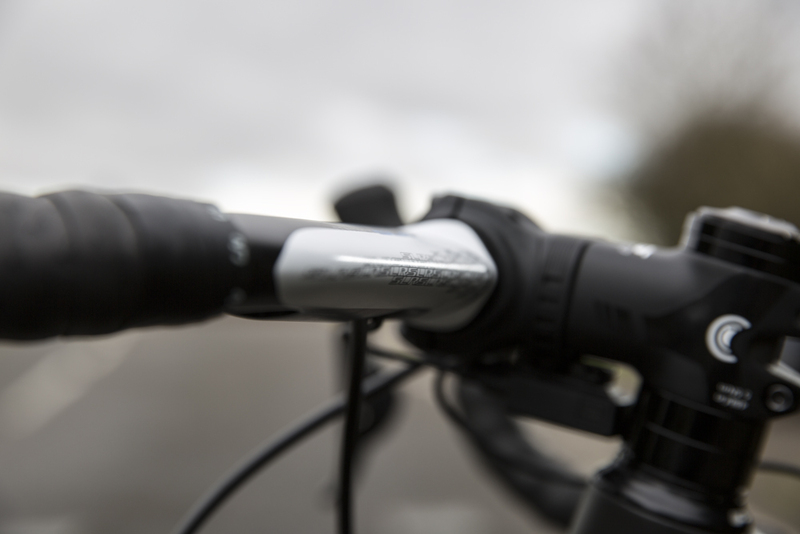 The Overdrive2 tapered head tube made for precise and responsive steering, giving confidence to really push it to the limits. The combination of the stiff and responsive frame kitted out with aero specific finishing kit meant as soon as I got on the bike it felt fast. Getting up to speed felt easy when wanting to press on during efforts, while long, steady rides on it were comfortable and relaxed. A quick run through the spec sheet leaves you in no doubt as to where every penny of your hard-earned £3,699 goes. A frame of this quality kitted out with Ultegra Di2 and rolling on deep-section wheels means that few racers will be left with a shopping list of must-have competition add-ons.